This has happened about 1 and a half month ago. There was this big build up to the event Holga, an employee of the PAD, who worked as like an organizer, „cultur-worker“ and teacher in Armenia for German education and culture. 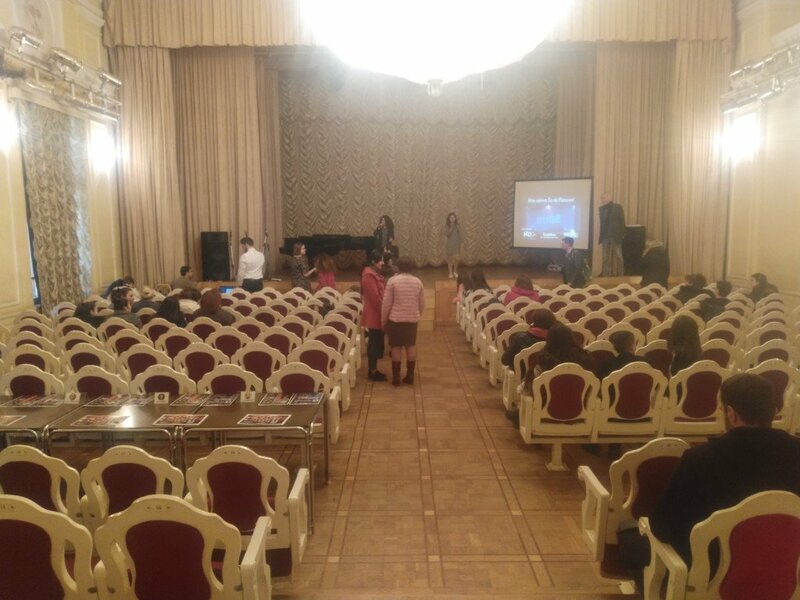 He planned out this big event which would bring together two students from all PASCH schools around Armenia for one big singing contest in Yerevan. So of course, my school was also invited to it. The contestants of my school where Ashot and Milena. Ashot had gotten the song „Augenbling“ by SEEED and Liana had the song „Wie schön du bist“ by Sarah O Conner. While Lianna had already experience in singing. Having a quite good voice, attending Singing school for a couple of years and singing in front of bigger crowds multiple times, I focused my attention on Ashot, who well was really doing his best. I still thought that he had quite the potential in the whole act so I really started thinking about many aspects. Thoughts about his actual performance, not only the singing, so the dancing, costumes and appearance came to my mind and I started to really feel the task I was given. So, over a few months, he and I started practising together. First, I started by just being there with him as he sang the text, by looking of the text, occasionally correcting his pronunciation and other minor mistakes. Next, I told him to learn he text off by heart, which was not an easy task, not even native germans, know it perfectly. The tricky part was that the last segment of the Song was in Patwa/Patua english, which already is ridiculous because he never had English lessons in his life. d)Me not pressing through to hunt him down and ask when he had time. But none of that now, let’s continue! We decided to dress Ashot up as like the Main Singer Peter Fox as he was on a different Album cover. It would be a slick suit with a tie. Over time, the act slowly came together. He learnt the text of pretty well, he even learned the english part unbelievably well. His behaviour on stage started to get better, so I took us to the next step. We scanned through the text together and found parts in the lyrics where he would do small dance moves or gestures to reflect the contents of the song. We had quite a few cool things. He had a part where he would act like someone should call him or h would point at a random person when he would say „You“. I sadly cant go into every single little detail of the whole performance which we planned out. If I find the copy of the Lyric text ill be sure to post it here, There you can see all the comments, marking and parts we changed, planned and how we interpreted them. The time ran through our fingers and for the last two weeks before the Event, I wanted to ask the Class teachers to tell the kids to go into the big auditorium where Ashot would be practising so Ashot could prepare himself to perform in front of a big crowd. Because the event would at least be attended by 200 people, I wanted to do anything, so that Ashot got used to perform in front of a crown and being comfortable in that position, because that plays quite a big impact on the actual performance. Sadly, that did not work out and well, I was a bit disappointed at myself, but I was sure that the performance would work out in the end. Well the day of the Event came around, it was a Saturday, and we (the two performers and me) had to be there at around 9 for a final check. So we all three hopped into Ashots parents car who where friendly enough to drive us there at 7:30 and made our way to Yerevan. The rest of the people invited, so a few teachers and students would be driven to the“Arno Babajanjan“ concert hall at around 11 where the performances actually started. We arrived a bit early and well soon after the other volunteers and Holga, the organizer I mentioned above , arrived and we were let in. So the people slowly arrive from the other schools aswell, and we start the whole final check up process. When it was my turn for the kids to come and practise, I made sure that they would move enough (plus points for the act) and there was another problem. The microphone was very sensitive with the distance of the sound, which meant that you really had to hold the mike close to your mouth, so it would work, Sadly even during the final check up, Ashot was struggling with it a bit and well, that kinda was a small foreshadow of what would happen later. The whole process at the start was too chaotic already. Martin and Elisa where put in charge for the slides and music and I was just helping out here and there where I could. We had too little time and well, there where teachers pressing us to be the next one to practise, while others wanted more time and etc.. It was chaotic haha. Anyways, we managed to get through the Bulk and the guests also started to settle in. We had quite prominent guests like the Minister of Education, the Mayor of Yerevan and the German embassador. Nikol Pashinyan was also invited, but he sadly didn’t come haha.I would rather skip the actual description of the Actual performance and explain it a bit, before elaborating on some pros and cons of the whole thing and other notable events that happened. So the event would be built up with each performer/group performing their song on stage with their music in the background, and after their act, would get a score from the four Judges that where there. (all of them, musical professionals and in the Armenian Music and industry business, well-known people). Now that was the Original plan, and well frankly, mostly things don’t go as planned and it didn’t haha. 1.The judges complained that it was too difficult to judge each contestant and would rather have a summarized feedback after every 3 acts or so. 2. One Judge just left after 15 minutes or so and didn’t come back. 4. We forgot to give the presents out in the end. 5. The event was pretty unfair since there was a big age gap present. The youngest performer was nine and the oldest 18. Otherwise, there was a big difference in the skill level. Some of the performers did what they did professionally, while other just did it for the first time. 1.Despite the Chaos, it was a pretty successful Event. It was published in Armenian Tv with Interviews and even back home in several prominent newspapers. 2.The judges handed out personalized awards to their favorite act, Like a Photoshoot or music video shoot. 3. I cant reiterate tis, but Holga. I know I have not talked alot about him but he really put so much work into this. Not only did he plan the whole event, he even contacted all the original artists of the chosen song and asked them to record, a message for the performer. One artist even ended up coming to Armenia. He really deserves alot of the credit here. A great man! Ashot: Ashot, as mentioned above, had a small problem with the microphone. That sadly was hearable in the performance, or shall I rather say… unhearable;) haha. But really it was a shame, and I must say that he had much better playthrough during our practice sessions, but I don’t really blame him. I could see, and he also told me that he was extremely nervous and well it just got to him. Im very proud of him, though! And that concludes the summary of that extraordinary event. What matters is that everyone had fun! And everyone did! P.S. A professional media crew was hired to take pictures and videos during the event and once I have a link or access to the material, ill post it on here!